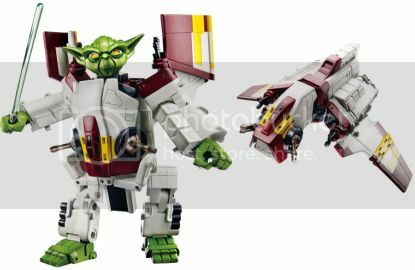 This Yoda Transformers “Attack Ship”–unveiled at Toy Fair 2010 and scheduled for release in August–makes me so profoundly unhappy. If your eyes have done something to really piss you off lately*, you can make them pay the price with more images of ridiculous forthcoming Star Wars Transformers over at Transformer World 2005. * No, seriously, though. If you and your eyes are currently on good terms, I do not recommend following that link. Good God, it looks like its got low hanging teats. Loath, that’s a better word for this. I love transformers and Star Wars but this is just so wrong! Wow. That’s just the worst thing EVER. Awesome. I must have that.